For most coffee lovers like yourself, we bet that you can prepare your coffee with your eyes closed. However, what may be a simple thing for you since you just want to get your first cup of coffee in the morning to wake up, for others is a much more delicate process that includes brewing coffee perfectly. And this takes not only time as dedication. While each one of us has their own preferred brewing style, the choice of the best percolator coffee maker should be deeply considered. After all, this electric coffee percolator will be responsible for delivering that amazing cup of coffee every single morning. While having a wide range of electric coffee percolators is always good, the truth is that it may also become overwhelming when you don’t know exactly what you should look for. 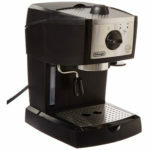 When you’re looking for a good electric coffee percolator, you need to consider the Capresso 405.05 12 Perk Coffee Maker. 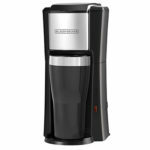 Made from a durable stainless steel, the Capresso 405.05 12 Perk Coffee Maker also includes a stainless steel filter unit that is included in the package. 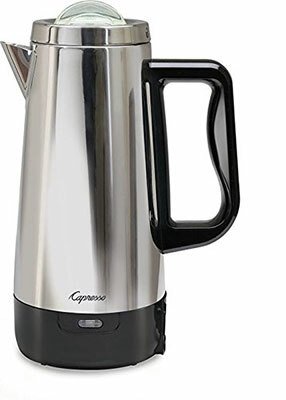 Featuring a traditional style that will allow it to be easier to serve as well as an ergonomically contoured handle, the Capresso 405.05 12 Perk Coffee Maker also has a stainless steel lid that allows you to view through glass insert. This 12 cup model includes an indicator light that will turn off automatically as soon as you coffee is ready. However, even if you’re taking some extra minutes getting ready before your coffee, it won’t be a problem since the Capresso 405.05 12 Perk Coffee Maker comes with a keep warm function as well as an insulated base that protects the underlying surfaces. One of the best things that we like about the Capresso 405.05 12 Perk Coffee Maker is the fact that you can detach the cord which will allow you to move this electric coffee percolator quickly. However, we also believe that when you’re preparing the coffee, the cord might be a little short. 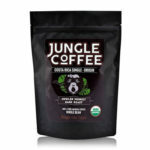 Make sure to take a look at the most comprehensive coffee blog. 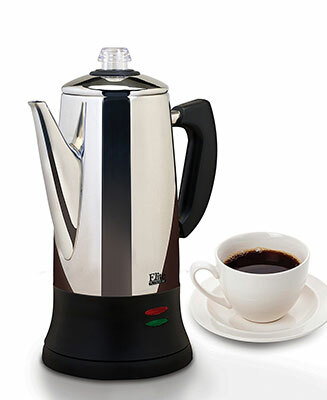 Another great option that you have when you’re looking for the best electric coffee percolator is the Farberware FCP412 Coffee Percolator. One of the things that first caught our attention was its modern design. 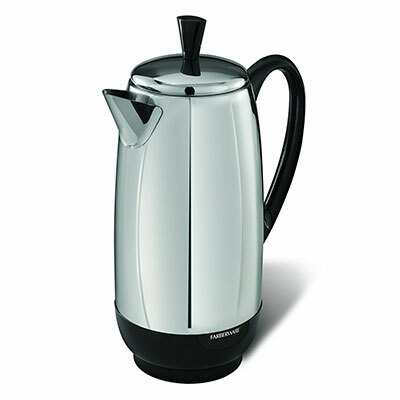 Made of a durable stainless steel, the Farberware FCP412 Coffee Percolator is the perfect choice if you’re looking for a percolator that is not only efficient as it is sturdy at the same time. One of the things that we really like about the Farberware FCP412 Coffee Percolator is the fact that it comes with a cool tap handle informative coffee level indicator. This is perfect for you to be aware of if you need to prepare more coffee. The Farberware FCP412 Coffee Percolator cord is also detachable that makes it a lot easier not only to serve as well as to store, and it comes with a warm heater that will keep the coffee warm. 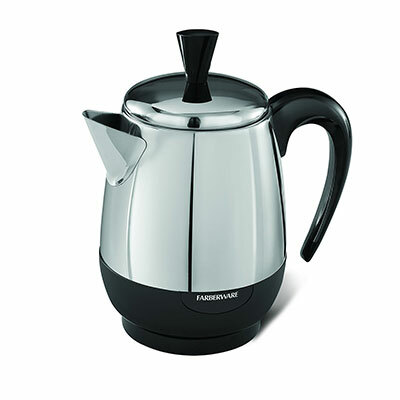 Most people who already bought the Farberware FCP412 Coffee Percolator keep mentioning the fact that it has a non-drip spout which makes sure that you won’t have any problems pouring your coffee. 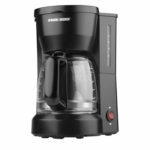 When you’re looking for an electric coffee percolator that is able to make your life easier, especially in the morning, you need to check out the Hamilton Beach 40614 Twist Lid Electric Percolator. 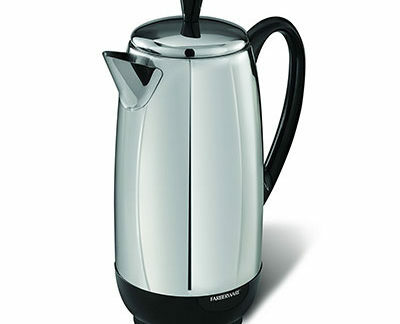 The Hamilton Beach 40614 Twist Lid Electric Percolator is incredibly fast brewing your coffee. It can brew a cup in about a minute. And this doesn’t make it prepare a bad coffee. Quite the opposite. Featuring an indicator light that will tell you when your coffee is ready as well as a detachable cord, you’ll be glad to hear that with the Hamilton Beach 40614 Twist Lid Electric Percolator you won’t have that usual mess. This electric coffee percolator features a non-drip spout. 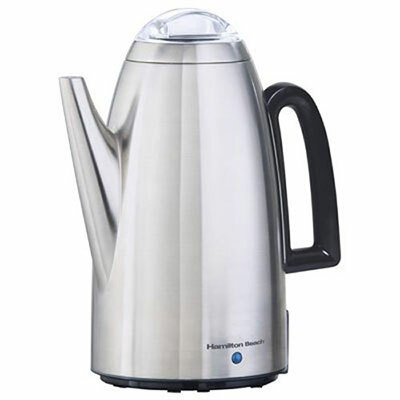 However, the feature that we really like in the Hamilton Beach 40614 Twist Lid Electric Percolator is the fact that the lid is made of glass. And this allows you to see exactly the amount of coffee you still have. While you may occasionally get some grounds in your coffee since the drain slots in the filter should be smaller, you can be sure that the taste of the beautiful coffee it delivers over-compensates. If you’re still not sure about buying an electric coffee percolator, make sure to check out the top coffee makers. When you’re looking for one of the best electric coffee percolators on the market, you should definitely consider checking out the Delonghi EMK6 Alicia Electric Coffee Maker. Featuring a beautiful Italian design, the Delonghi EMK6 Alicia Electric Coffee Maker is not only space conscious as it is portable making it one exceptional addition to your office or kitchen. The Delonghi EMK6 Alicia Electric Coffee Maker is built with high-quality materials and it comes with a cool touch base that you can use to plug the percolator anywhere you want. This sturdy aluminum base is incredibly resistance and the fact that the Delonghi EMK6 Alicia Electric Coffee Maker also comes with a transparent container, makes it even more perfect. After all, you’ll be able to watch the the entire brewing process. One of the safety features that this electric coffee percolator includes is the automatic shut off. This will prevent it from overheating as well as it will be the one responsible for keeping your coffee warm up to 30 minutes. The Presto 02811 Stainless Steel Coffee Percolator is another great choice when you’re looking to have that perfect cup of coffee first thing in the morning. This electric coffee percolator allows you to prepare 12 cups of a delicious coffee. One of the things that best characterize the Presto 02811 Stainless Steel Coffee Percolator is the fastness. The Presto 02811 Stainless Steel Coffee Percolator is incredibly fast in what concerns with the brewing process taking less than a minute per cup. One of the things that could actually improve is its design. After all, it is completely made of steel, even the filter basket. While some users like it, others just hate it. However, we shouldn’t judge a book by its cover and we’re glad we didn’t in this case. 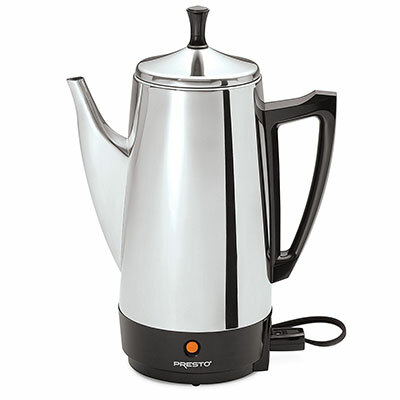 The Presto 02811 Stainless Steel Coffee Percolator is one of the best percolator coffee makers on the market due to the fact that it is fast but also due to the high-quality of the coffee it prepares. One thing that you need to know is that you need to be on its side while the Presto 02811 Stainless Steel Coffee Percolator is working. Since it doesn’t have an automatic turn-off feature, you need to be the one to do it. However, as soon as your coffee is ready, you will see the indicator light. When you’re looking for the best electric coffee percolator that is easy and simple to use, you need to consider the MaxiMatic EC-120 Elite Platinum 12-Cup Electric Percolator. The MaxiMatic EC-120 Elite Platinum 12-Cup Electric Percolator features a lightweight, compact, and portable design that makes it a great option when it’s time to serve. One of the things that we really like about the MaxiMatic EC-120 Elite Platinum 12-Cup Electric Percolator is the fact that it comes with a removable base. This way, you won’t need to think about the cord when it is time to serve. Plus, it includes ready indicator lights that will let you know as soon as your coffee is ready. The MaxiMatic EC-120 Elite Platinum 12-Cup Electric Percolator will make sure that you never drink your coffee cold again since it includes an automatic keep warm. Many coffee lovers just love the Bialetti 6-Cup Stovetop Espresso Maker and this is why this is the #1 Best Seller on Amazon. Featuring a beautiful design of Bialetti Octagon shape, it is made from high-quality polished aluminum which is not only resistant to abrasion as well as it is resistant to stain. 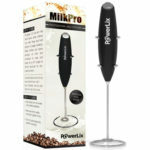 Since it includes a wide mouth, it easy very easy to prepare your coffee. 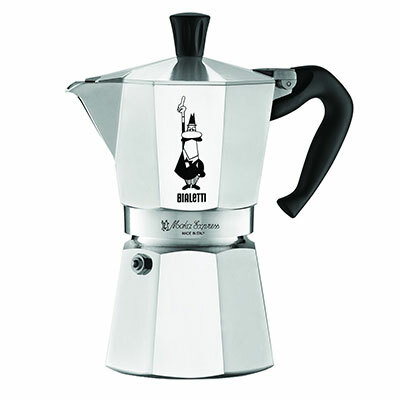 One of the best things in the Bialetti 6-Cup Stovetop Espresso Maker is the fact that they use an innovative percolating technology. 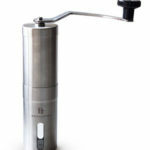 This is what allows this amazing percolator to deliver a delicious coffee brew effortlessly. The truth is that this new percolator is able to extract coffee grounds quickly without removing any of their taste, flavor, or aroma. In terms of safety, you can count with a patented safety valve. 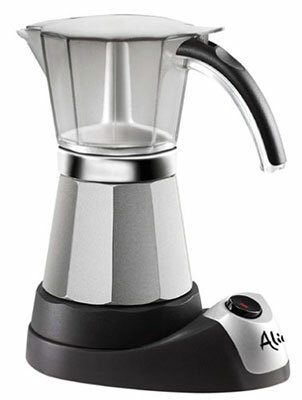 Plus, the Bialetti 6-Cup Stovetop Espresso Maker is easy to clean since you won’t have any problems dismantling it, as well as it has a detachable cord. The Cuisinart PRC-12 Classic Electric Percolator is another great option to consider when you are searching for the best electric coffee percolator. 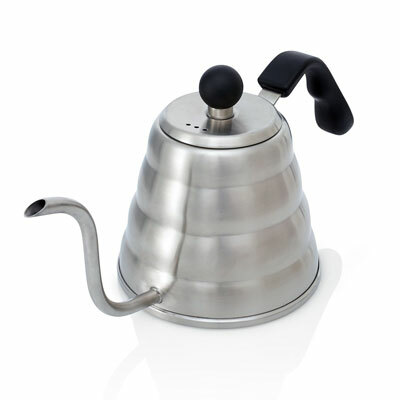 Featuring an elegant stainless steel design, it can easily brew between 4 and 12 cups easily. In case you’re looking for a coffee percolator that is able to deliver that robust tasting brew with that amazing aroma, you can be sure that you won’t be sorry for buying the Cuisinart PRC-12 Classic Electric Percolator. One of the problems many people usually have when they are using percolators is that they end up with their coffee burned due to the overheating. However, this isn’t the case of the Cuisinart PRC-12 Classic Electric Percolator. One of the things that you’ll like to know is the fact that it features a cool bottom as well as a cool-to-touch handle. Plus, the detachable cord makes it a lot easier to use when it’s time to store or serve. 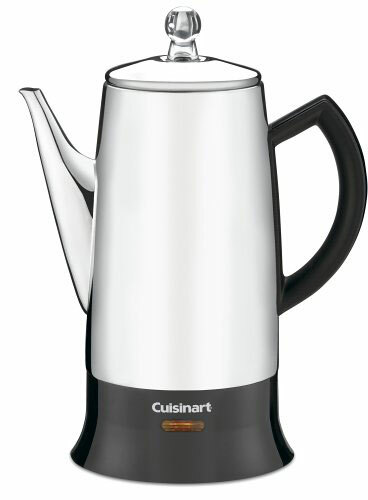 Plus, in what comes to pouring and cleaning, you can bet the Cuisinart PRC-12 Classic Electric Percolator is one of the best percolator coffee makers on the market. Made from a heavy-duty material, the Farberware FCP240 Electric Coffee Percolator features a beautiful and elegant design that will perfectly fit your kitchen. When you want to make sure that you won’t need a lot of time to drink your cup of coffee first thing in the morning, the Farberware FCP240 Electric Coffee Percolator might be one of the best options you have. After all, it only takes about 1 minute to process. However, in case you need a bit more time to get ready, don’t worry. The Farberware FCP240 Electric Coffee Percolator also has an automatic keep warm feature that will make sure that your coffee is warm, and not burned. Featuring a lid knob that includes different edges for easy handling as well as a cold touch handle, the Farberware FCP240 Electric Coffee Percolator is a very versatile electric coffee percolator that you can also have in your dorm or office. In our opinion, there is only one thing missing to the Farberware FCP240 Electric Coffee Percolator – an automatic switch-off feature. 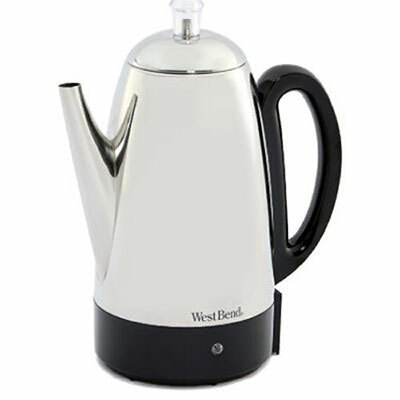 Last but not least, you have the West Bend 54159 Classic Coffee Percolator. Considered a bit pricy for some, for others is the best coffee percolator they have ever used. Featuring a retro design and made of stainless steel, the West Bend 54159 Classic Coffee Percolator is complemented with a transparent top. So, you can be sure the West Bend 54159 Classic Coffee Percolator will look absolutely amazing on your kitchen counter. The West Bend 54159 Classic Coffee Percolator is able to produce between 2 and 12 cups of delicious coffee as well as it is able to maintain it hot without burning. One of the things that definitely attracted us is the fact that it includes a floating red ball in the handle. This little ball serves to let you know how many cups you still have in the percolator.